A pond is a magical place for a child, it is teeming with life and a source of great fascination and wonder! If you are lucky enough to have one nearby it will no doubt already be on your child’s list of favourite places, but if you don’t have one locally it is well worth seeking one out for a fun afternoon’s amusement. Spring time is particularly busy down at the pond, as everything bursts into action after a sleepy winter. Collecting a small amount of frog spawn and bringing it home carefully to watch the tadpoles develop has to be one of the most exciting spring activities, and one that will stay with your child forever. Use the free printable sheet in our Life at the Pond rhythm game pack to talk about the different sounds and actions that all these different creatures make. 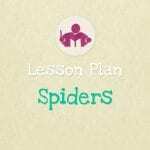 Then develop these ideas further into an excellent rhythm activity that encourages imaginative movement, note recognition and listening all combined in this fun game. 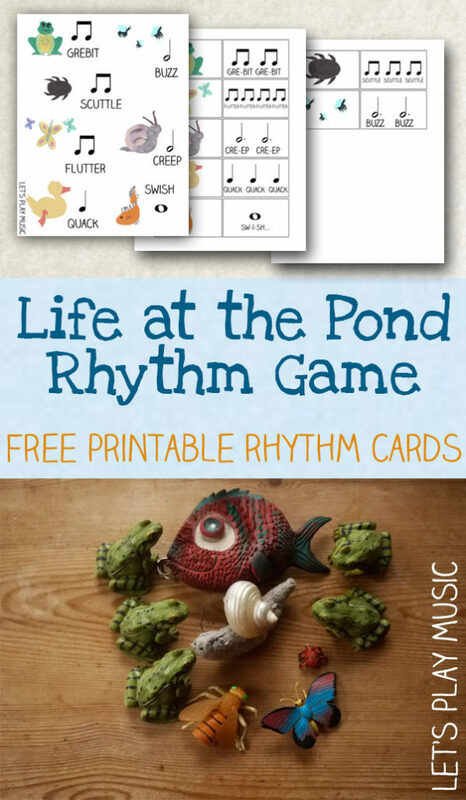 Our Life at the Pond Rhythm Game Pack includes printables for rhythm cards as well as a colourful poster. The poster has pictures of different animals that you might find at a pond with a corresponding rhythm, as well as rhythm cards that you can print and mount in order to play the game. Alternatively, rather than using the flash cards you can use toys that you might have lying around as a prompt – a duck, frog, fish etc. 1. Using the main sheet, discuss the sound and rhythm that belongs to each picture. Practice these together several times. 2. Play a guessing game where you tap a sound and rhythm and ask the child to point to the correct picture. If they find that easy, then do it in reverse by showing them the picture and seeing if they can guess the corresponding sound and rhythm. 3. Now discuss how each creature would move, and encourage lots of suggestions and impersonations with imaginative movement. 4. Place the flashcards face down, and invite the child to pick one at random. See if they can remember which sound, rhythm and action belongs to each animal. Depending on the age of the child, they might need a bit of help at first, but they’ll soon get the idea. 5. To make this a bit more challenging for older kids, try choosing different percussion instruments to represent each creature, and lay them out next to the cards. When they pick a card, they must also choose the correct instrument to tap the corresponding rhythm with. This develops listening and memory skills further. If you try this rhythm game at home or in your classroom, we would love to hear how you got on over on our Facebook page! 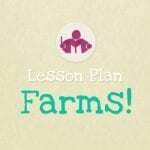 Looking for more rhythm games and activities? Check out the tons of ideas pinned to our Rhythm Games Pinterest board. Follow Sara @ Let’s Play Music’s board Rhythm Games & Activities on Pinterest. Hello!!! Do you have any practical tips or exercises for pre teens who seem to be bored with the standatd style of music teaching? I have tried some different methods but can’t seem to get. One child’s interest. It seems that what worked no longer does. I appreciate any assistance you can give. Thank you so much! Hi there! I think we’ve all had the same experience at one time or another! let’s Play Music focuses on early music education up to 7 years, but I’m sure there would be be lots of other sites that specialise in the pre-teen age group. 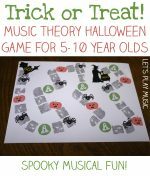 teachpianotoday.com has some fantastic ideas to engage older children and although it is primarily a piano blog, they have lots of cool ideas for theory too! Thank you for linking up to the Kids Learning Printables Linky Party. Your post has been featured this week! I absolutely adore your activity, especially since it involves music (my passion & degree).